A strange force drags Billy, Lexi and Kurt to the land of goblins, where prophecy claims a goblin king will come in the hour of goblins’ greatest need. Hop, a timid soldier in the goblin army, knows there can be no greater hour of need than right now. The ruthless General Sawtooth plans to lead what remains of the goblin army into battle against a foe that cannot be defeated. He will only bring them death. So when the goblin crown pulses with the glow that announces the king’s arrival, Hop is determined to find him and see him crowned, even if he has to fight all of goblin-kind to do it. I feel like I have a love-hate relationship with the “through the doorway into a magical world” kinds of stories. I’m always worried that they’ll come off cheesy or too predictable. And of course, it is a bit predictable in the same way that a romance novel is. I didn’t mind that, actually. Another thing I liked is that this story features a more diverse cast than I’ve seen in a book like this before. I loved having Hop’s point-of-view, too. He cracked me up. I loved that he constantly faces challenges that force him to overcome his natural tendency—running and hiding—in order to do the right thing, usually the last thing he feels like doing. The fact that he so often puts aside his fear and responds bravely made me really love that guy. I liked Billy and Lexi, too. Even Kurt the football star shows surprising depth throughout the course of the story. I liked that Kurt doesn’t get pushed to the side totally and that he has some valuable input in helping his allies pursue victory. Of course, there were some really funny moments where cultures clashed—modern day humans vs. goblins. I loved that. The only real complaint I had was the graphic nature of some of the battle scenes. I feel like the author wanted the goblins to read like these really brutal warriors with very different traditions, especially with regard to battle, than we have. And that definitely comes across clearly. But some of the descriptions (though brief) were more intense than I expected for a novel which otherwise reads like a middle grade story. See more detailed content information below. Recommended Age 12 up. (Other than the violence, this reads to me like a middle grade story. Younger readers less sensitive to or less concerned about violent content may be interested in this book. Billy is half African American and half Irish. He talks about how hard it has been to feel like an outsider everywhere, never really belonging to one group or another. Later he discovers a whole kingdom of humans who look like him. Lexi is Filipino. Kurt is white. Other major characters are goblins. It’s clear Billy has some feelings for Lexi, and that she possibly has feelings for him. This story doesn’t explore them. A prophetess calling herself the Dark Lady emerges from the reclusive elves. She uses prophecy to stir up the goblins for war and leads them into battle. The goblins mostly worship the Night Goddess. Her Templars serve her and deal justice to the people. Hop doesn’t believe in any gods, only in himself. He briefly laments this because it means he remains without the comfort prayer could bring. Wizards use magic to attack and to heal, but at a personal cost to themselves. Wizards who perform too much magic go insane. Battle violence. In an early scene, the winning army puts the Dark Lady’s head on a pike at the end of a brutal battle. Later, one goblin is literally torn apart by others. His head is put on a pike, too. There are several scenes showing battles, one in which soldiers use light to incinerate their enemies. Wizards use magic to attack. Hop drowns his sorrows in mushroom wine after a plan goes awry. 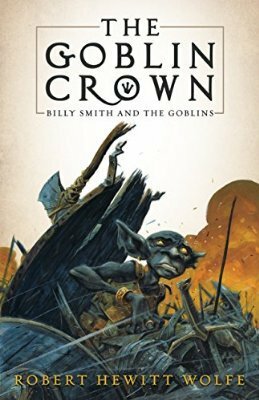 Tagged Billy and the Goblins, Robert Hewitt Wolfe, The Goblin Crown, Turner Publishing. Bookmark the permalink.